When I write SQL there is a bit of trial and error (laughter), so I need as complete a set of test cases as possible. Here’s what I came up with. Would you believe that one of my solutions doesn’t work when the input has no rows? Well…let’s put it this way, I never said what “working” should mean with no input rows. Now that I’ve added that test case, I have to say what output I expect. This is another situation I never bothered to think about – until now. With two ranges to compare, it only takes 7 test cases to cover all the relations defined in Dr. Allen’s Time Interval Algebra. The image mentions “day of month” but the logic would be identical with numbers instead of dates. The boundaries are starting and ending points: the starting point is included in the range, but the ending point is not. 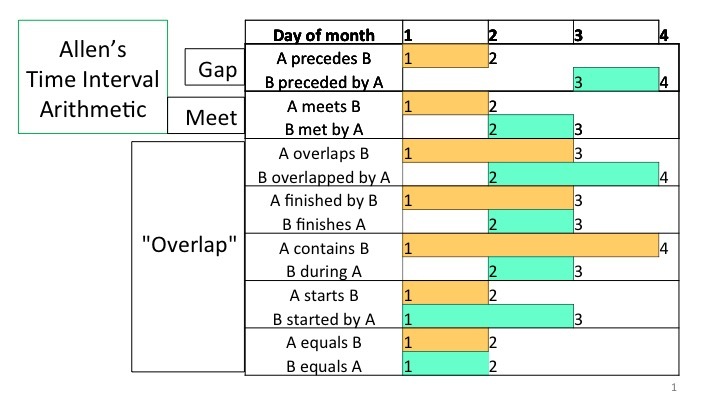 When A’s ending point is equal to B’s starting point, the ranges “meet” with no gap and no overlap. In all the time I have looked at range-related problems on forums, every bug could be illustrated with at most three ranges. I decided to generate all the possible combinations of relations: range A to range B, A to C and B to C. It turns out there are 75 valid combinations, so 75 test cases at 3 rows per test case. Start and end can both be null. For completeness, I’ll add case “0-n/a”: when there is a gap, the attributes are not compared. When there are three ranges, there are up to 79 different combinations of comparison. Forgive me for not publishing the actual test data, and the convoluted code I used to generate it. I may show bits as needed in later posts. Next up: finding gaps in ranges.